This is one of those cards that just evolved. I’ve had the butterfly stamps at hand while teaching a class with them. I did not have a definite plan; in fact, you may be surprised to hear it started with three butterflies stamped in rusty hinge distress ink. The panel sat around for a while then I decided to paint turquoise brusho and metallic sky liquid metal inside each of the brown butterfly outlines. I didn’t love that so I spritzed interference blue pearl-ex spray over all three butterflies to make the colour bleed into the surrounding area. Still not right, so I employed a technique one of my friends calls ‘drowning’ and spritzed the panel thoroughly. 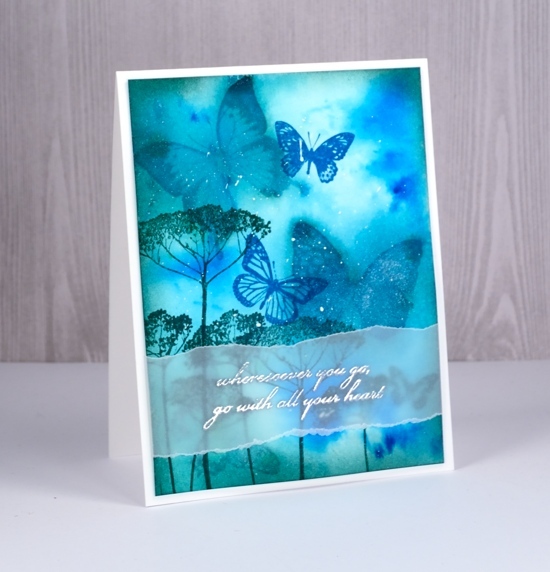 The result was a sparkly blue panel with muted butterflies now looking like background images. 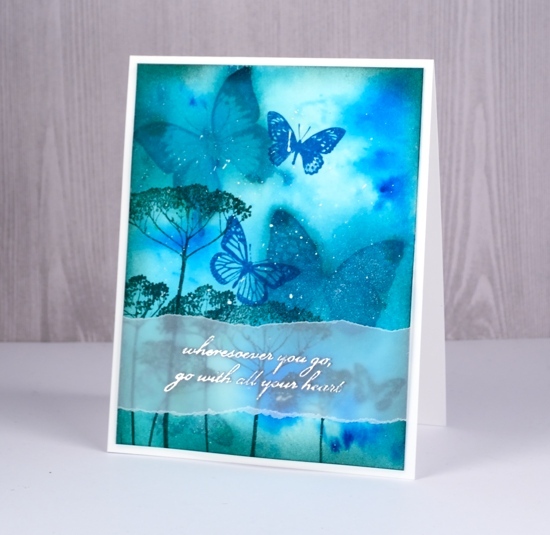 I used pine needles and mermaid lagoon distress inks to stamp foreground images, more butterflies and some flowers. I framed the panel by sponging pine needles ink around the edges then splattered a little white gesso over it. As often happens with my cards I started thinking about a sentiment once there was no room left for one. Vellum to the rescue with an phrase embossed in silver. So lovely. Love its feeling of ‘other worldliness.’ Well done. Love this, and all of these things that take on lives of their own. This one is so dreamy, glad the vellum doesn’t cover up any of it! Perfect. Love how accidents turn into something beautiful. Drowning does work I guess. Super cool! I love when things evolve from ugg to wow this actually works!! Glad you kept going with it! Loved your story about how this beautiful card evolved from such a dubious beginning, and laughed about the last step of adding a sentiment. I always love your projects. Beautiful card! I was going to ask you to show your technique on those “Flutterbys” in the background, a real stunner of a card Heather. LOVE IT. So glad I found you from a post on Darkroom Doors on instagram. It’s especially nice to meet a fellow Canadian. I am on the West Coast in Victoria! Great card Heather.